Beer, Brass and BS has EVOLVED! What used to be Austin's preeminent Steampunk social gathering is now that and so much more! 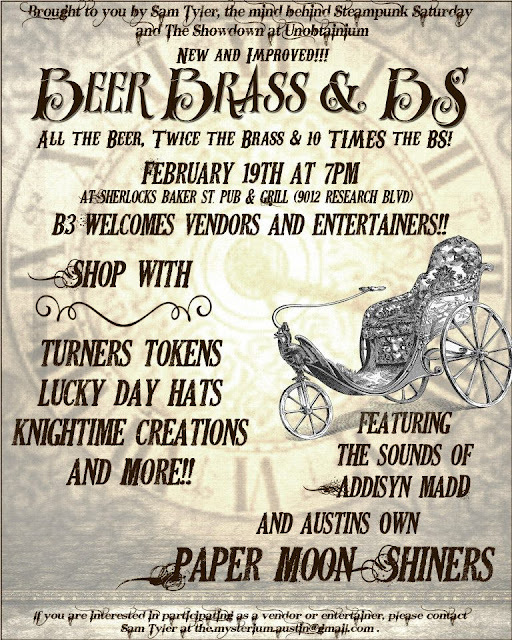 Starting February 19th, B3 will be hosting local steampunk vendors and mucisicans and other performers! Addisyn Madd, followed by Austin's own Paper Moon Shiners!!! Come on out to Sherlock's Baker Street Pub & Grill to mix and mingle with Austin's steampunk elite! Eat dinner, drink beer, shop and hear live music and/or other presentations! Remember, it's the 3rd Tuesday of the month, every month at 7pm! Also remember, Beer Brass & BS is for steampunks and steam curious alike! Don't wanna dress in your steamy best, or still looking for those special pieces to make your outfits better? No problem! Come as you are, and have a great time socializing with Austin's friendliest steampunks!!! I'm looking forward to seeing you all there!! 2012 and Health - New Updates to Site!